Our fantastic Easter bonnets, the children are ready for this afternoon's parade! Ian helped us to draw a bird. Can you see how we used dots to create circles and build up the picture? Look at the final picture - we learnt how these techniques help us in life. Here are some examples of the work Puffin children have done to celebrate 'Mental Well-Being Week'. Puffins had a fantastic time with Joe improving their catching and fielding techniques. See you soon Joe! We have some Mathematicians and Scientists in Puffin Class today. Year 1 children had fun timing themselves for 1 minute and putting their results on a table. Indian Music with Mr Arter. Every Wednesday Joe is working with Puffin Class to improve their catching and fielding skills. Even the rain didn't stop the fun! World Book Day! Puffin class look fantastic today dressed up as their favourite character. Yesterday the Fire Service came into Puffin class. We learnt how to 'Stop, Drop and Roll' and how to create a 'Home Fire Plan'. 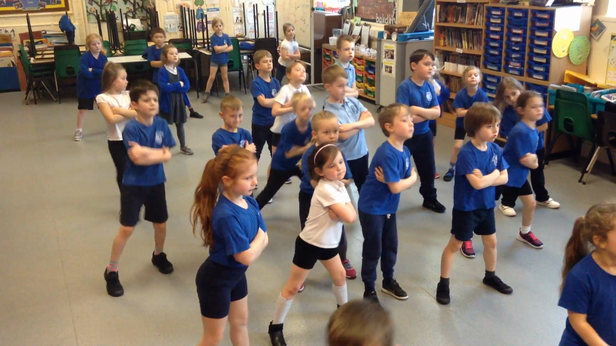 Puffin Class had great fun doing a hip hop dance. Thank you everybody for all the hard work given to the continents homework. They look amazing! In Science, we got to look at the properties of slime. We had to investigate which slime would be best for the slime manufacturers to make. Puffin Class decided that glitter slime was the best. Oh what fun we had following instructions to make and fly paper aeroplanes! Puffin class had a fabulous party and even had a special visitor! Can you guess who it was? We have designed bunting for Robin Class, watch out for the display next year. Well done for the fantastic work on The Great Fire Of London. Thank you for making poppies for the outdoor display. Have fun reading our shared write - Thumper's Big Adventure.